Yesterday the Agency Group inducted a speed demon, Wipeout XL. This sterling racer never quite became a smash hit, but it surely holds a strong spot in the hearts and minds of anyone who played it. On the other hand, the last honoree of the week is an absolute phenomenon, and one of the most significant games of the past two decades. Much like Treasure - developer of the previously-honored Ikaruga - Blizzard Entertainment is a ridiculously solid company that could've merited multiple entries. As I decided which games would make it, their titles were extremely hard to eliminate. One, however, stood out as an easy choice: StarCraft. This groundbreaking RTS sold like hotcakes, achieved a balance still sought after by other games in the genre, established a revolutionary online network, and completely took over a nation. First of all, StarCraft is a remarkably successful, acclaimed title. 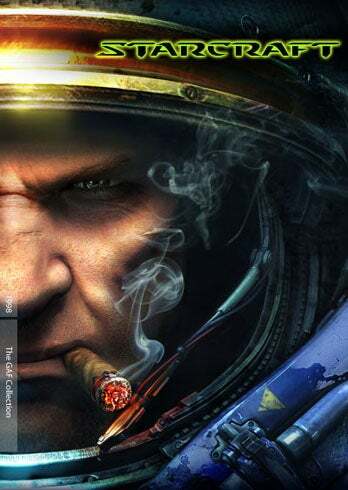 Its 11 million in sales place it near the top of the all-time PC charts and reviewers hailed the top-notch combat, variety of its three main races - Protoss, Terran and Zerg - and satisfying combat/strategy that managed to surpass that of Blizzard's hailed WarCraft series. Said combat works so well because the prodigiously talented Blizzard maintained a meticulous balance between the races that ensured gamers could both win and have fun using a variety of potential tactics and units. Many a strategy game has been skewed when its users discover an inherently superior way of battle and render everything else in the title useless. Meanwhile, StarCraft was constructed so perfectly that one could use any race and a variety of ideas could lead you to victory. Whether you rushed, warped or nuked, you could find your niche and build off of that beautifully. The celebrated expansion pack, StarCraft: Brood War, managed to add new units and ways to play without tipping that crucial balance, an admirable achievement. It's hard to appreciate this now, in an age of XBox Live, the PlayStation Network and a robust online ecosystem for almost every major PC title, but Battle.net was a ridiculously strong matchmaking system in the late 1990s. It evolved from its initial introduction in 1996's Diablo and supported StarCraft as it grew into a world-beater, and it's still in use today for both players of the classic game and those who migrated to the 2010 sequel, StarCraft II: Wings of Liberty. Take note of that timeframe, by the way: Blizzard is notoriously slow in development, yes, but StarCraft retained its popularity, balance and players for over a decade before a sequel was released. And finally, the popularity of StarCraft in South Korea is absolutely stunning. 4.5 million copies were sold there, which comes out to slightly under one in ten South Koreans owning the game. While in the US professional gamers just received official recognition as "athletes", across the Pacific Rim StarCraft players are legitimate celebrities, attracting crowds - and salaries - in the hundreds of thousands while getting sponsored by companies like Samsung. The sequel had advertisements on airplanes. The game's reach even extended to the classroom and the military...a UC Berkeley course - that could be taken for credit - utilized the game to teach decision making, game theory and critical thinking. Meanwhile the United States Air Force even used the game in the late 90s to instruct in teamwork and crisis planning, finding its balanced and detailed battle tactics easier to use than an attempted simulation of real-world skirmishes. What other game could manage that? Finally, in a retrospective on the greatest games of all time, GameSpot had this to say: "With its excellent campaign, elegantly designed factions, and simple to learn but deep, strategic gameplay, StarCraft is the defining game of its genre. It is the standard by which all real-time strategy games are judged". You can buy StarCraft through Blizzard. To recap this week in the Agency Group: we began with a paragon of player choice, moved to a minimalistic and brutal delight, spotlighted the most famous game ever and sped into the future before finishing with this PC juggernaut. Next week, I'll continue the inductions with a game whose star's mental abilities gave gamers one of the most unique gameplay mechanics of the 2000s.